A jealous young man who smashed a window after he had a row with his partner has been forced to pay over £800 in compensation. Chesterfield magistrates’ court heard on February 26 how James Darral Kirkland, 20, of Peveril Road, Bolsover, kicked a window at Croft Veterinary Centre, on Market Place, Chesterfield. Prosecuting solicitor Neil Hollett said: “The defendant approached a large external glass window after an altercation with a female on the street and he took his frustrations out on the window by kicking it and causing to shatter. Kirkland told police he damaged the window after he had been drinking and he had been talking with his girlfriend whom he believed he had been cheating on him. It was first thought the damage was valued at £205, according to Mr Hollett, and Kirkland may have been able to pay compensation so the matter could be dealt with by restorative justice but the compensation was not paid. Mr Hollett added that since the incident which happened about 2am, on July 15, last year, a request for compensation has now been submitted for £804. Kirkland, who has previous convictions, pleaded guilty to causing criminal damage. 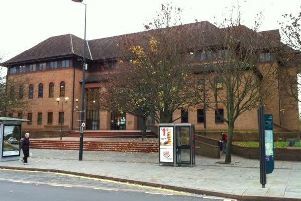 Mr Lau added that Kirkland was a garden labourer at the time of the incident whose work was seasonal and he could not pay the £804 compensation at that time so the matter came to court. Magistrates sentenced Kirkland to a 12 month conditional discharge but warned him if he commits another offence in the next year he will be re-sentenced for the damaged window. He was also ordered to pay £804 compensation, a £20 victim surcharge and £85 costs.